Percy and Ray Bady, sons of the Rev. George E. Bady, have a successful music ministry reaching many people through their singing and rapping of their own Gospel music compositions. 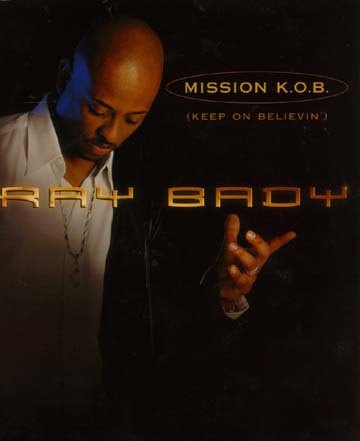 Ray Bady has come out with a new album, MISSION K.O.B. (Keep on Believing). Through these songs, Ray and Percy Bady's Christian faith and dedication to Jesus shines forth, staying true to the Mission Statement, stated in cut 1 of the CD. It is set up like the beginning of a Mission:Impossible T.V. episode or movie, only it is the Lord talking to Ray: "Ray Bady, your Mission if you choose to accept is simple. You have been chosen to tell a dying world, about the risen Savior, in a way that only you can do. Tell them through song, but show them through your life style. Now go in peace." "Are you man enough? Are you tough enough? Can you handle this?" You Bet Ray is!! With some help from his brother Percy, who performed and wrote some songs as well, Ray Bady's CD introduces Jesus Christ, as being the source of that joy, comfort, protection, grace, and mercy, which can only be found in the ever faithful, dependable Jesus Christ. Jesus sees our needs, overlooks our faults, fills us with his love, inspires us to walk the talk of the Christian Life, which keeps us close to Him. Through inspired lyrics combined with the Badys' unique, creative style of upbeat Gospel music, that is always different in every song, (never boring), and produced in a "cutting edge" manner, this CD, in an entertaining way, explores the qualities of Jesus, why belief in him is so important, how this belief changes a person. Also explored are the struggles Christians go through while walking the sometimes difficult path with Jesus, giving their listeners some suggestions, that have worked for them. 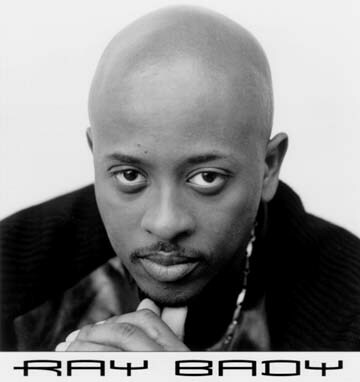 Besides being a terrific drummer / percussionist, Ray Bady is also a talented singer and song writer, and the combined talents of both Ray and big brother Percy have created something that is faith inspiring, soul feeding, uplifting, and encouraging to the disheartened, discouraged Christian audience and to those as well those who are seeking a hope, a joy, a purpose in life that one can only find in Jesus Christ. LIVIN' THIS KINDA LIFE (Lyrics by Percy Bady & Raymond Bady, Music by Stereo). A high energy, enthusiastic dance / praise song sure to lift your spirits! Becoming a Christian gives you a new inner joy, clearer vision of the truth, and a sweeter, existence, walking the straight and narrow path with Jesus Christ, a life style based on his word. Lyrical Sample: I turned in my letter! I gave up the game, Picked up my Bible, now I'm walking in Jesus name. Nothing could be better than, the joy that I feel inside, No longer feelin' empty, since I gave the Lord a try. Chorus (Channel & Hook): Everyday gets sweeter, (than the day before). I can see more clearer, (now that I have real joy) Livin' this kind of life, I can get use to this, stay true to this, cause I'm lovin' this, Livin' this kinda life. A testimony to Percy & Ray Bady's faith. Believe, depend on the Lord, not on your job or your friends. The Lord is ever faithful and never fails. This soulful rendition with an easy Gospel beat is a joint effort, beautifully done with piano, organ, strings, and a great back-up choir. "When all else fails, keep on believin'! " - Percy and Ray Bady. Lyrical Sample: 1) Heard about a lady who could see what lies ahead. Many came by thousands, just to get their futures read. And I could just imagine the looks upon their face. Filled with anticipation, about the words she had to say. I'll keep my heart my mind on heavenly things. I'll trust and never ever doubt. I'll look to the hills from which cometh my help, for I know my help comes from you. That's why. Chorus: (Hook) I'll keep on believin', (I will) I'll keep on depending on you. Cause when all else has failed, Lord you are still there! Yes you are! Bridge: Heaven and earth shall all pass away, but your word will truly stand. So I'll keep on believing! Keep on depending! Know that you'll always be there. Ray's sweet, clear voice brings this song to life, over quiet chords and instrumentation, and easy Gospel beat. Interesting harmonies can be heard in the chorus. Lyrical Sample: 1) Have you ever, thought about what it means, to go without. No food to eat, a place to sleep, someone to care, about your needs. And have you ever wondered why some people live, some people die. Never knowing the meaning of, what it means to truly love. Chorus (Hook) The Simple things,1,2,3. That mean everything, A,B,C. Like a penny, a dime, or some of your time, 1,2,3. That means everything, the simple things. HE'S ABLE (Written by Percy Bady / Music by Lilly Mack) - Piano, organ, electric guitar, easy percussion, strings. A reminder to all that the Lord is in control of all circumstances. Romans 8:28 - And we know that in all things God works for the good of those who love him, who have been called according to his purpose. 2) And though sometimes I struggle, there's a war deep within. I know the Lord is my refuge, on Him I can depend. So I'll keep the faith, I will watch and wait. Cause I know that he's able. Chorus: I know that he is able, to deliver me now . I know that he is Able. Able, Able. Believe that he is Able, (to do all that we ask him). I know that he's able to deliver me now. THINGS THAT MAKE YOU SAY, UMM! (Written by Ray Bady / Music by Ray Bady & Lilly Mack) A rhythmic, upbeat dance - praise song, thanking the Lord for all the wonderful blessings he gives believers of Jesus Christ, Lord and Savior. Lyrical Sample: 1) I'm thinking about the times, the Lord has rescued me. Could've been dead and gone, or livin' under Wacker street.....You better stop tripin' on the small things, And thank the Lord for who he is. Channel: I get excited every time I think about how the Lord has set me free. How he loosed my chains and everything that had me bound, and how he set my soul free. Hook: Things that make you say um um um um um! Like His joy, like His love, like His peace, like the cross, that he bared, on Calvary! Like the blood, that he shed, when he died, knowin' that, He's comin' back, for you and me. Things that make you say um,um,um,um,um,um! Brand new Mercies every day, and it's written on my face. Don't deserve all your love, but you send it from above. For my faults you died, for my sins you died. Things that make you say um ,um,um,um,um,um! Don't know why, why you love me, don't know why, why you want me, don't deserve it, deserve your love, but I need it, gotta have it. GOD DON'T WANT NO HATERS IN THE CHURCH (written by Ray Bady/ Music by Ray Bady / Lilly Mack) - Interesting rhythm in synthesized beat & drums, strings, other misc. instruments. Points out that is impossible to dwell in hatred and be an affective witness for Jesus Christ, which is the mission of all believers, to show His love, draw people to Him.
. Luke 6:27-28 - Love your enemies, do good to those who hate you, bless those you curse you, pray for those who mistreat you. (Why?) Luke 6:35-36. Because the Lord is kind to the ungrateful and wicked. Be merciful just as your Father is merciful. 1) 5 o'clock in the morning, something bothering me. How can I love God who I ain't seen, and my brother I can't stand to see. See we got a work to do, can't do it by hate'n on you. Just remember to bless them, I'm talkin' bout the one who been hate'n on you! Chorus: God don't want no haters off up in the church. You say why? I'll tell you why, cause each one should just reach one. 2) Don't be consumed by the mess your hear, but delight yourself in his love. Be a witness to someone, show them that real loves comes from above. Bridge: Gotta stop being fake, too many souls at stake, We need to keep it real, stay on an even keel, Gotta take off that mask, worldly ways will not last. Our streets we must control, winning souls is our goal. The last three songs are a powerful testimony to the life-changing influences of Jesus Christ, as we learn to trust and depend on Him more and more. LOOKIN' 4 LUV - (Written by Ray Bady and Kevin Randolph) Changing life style after becoming a believer. Finding his closest friend in God's love. Finding an end to his pain, and power to change. Chorus: I've been looking for love in all the wrong places, Ran the streets way too long, thought my friends could make me. Worldly ways gotta end, for my mind to be free. With God on my side, ghetto life put behind me. 2) Now living saved it ain't no easy thang. Sometimes there's joy, and sometimes there's pain. But God's love has it's benefits. Everlasting life is what you'll get. A song of hope for people going through trials and pain urging them to call on His name, trusting in the promises of the Lord, having faith that He will provide what is best for you. Lyrical Sample: Somebody's out there searchin' for a way to ease the pain. Lookin' to find that answer to the problems that they face. I know someone who will help you, help you ease the pain. He will fight all of your battle if you just call on his name. Chorus: (Hook) It's in the name of the Father. It's in the name of the Son. It's in the name of the Holy Ghost. The Victory is Won! A prayer of love and praise for what the Lord has done, and will do, and his complete, unconditional love He blesses us with. "The best love is from above." Lyrical Sample: 1) There are times when you're there for me (even though I'm wrong) You love me still. You look beyond every fault of mine (and you see my needs) You see where I could be. I've never found anyone like you (inspite of what you knew I do) You still gave me your Son. Now because of what you did for me. I proclaim you the holy one.